Home » How-To Library » What Goes With My Boiler? How warm does a coat keep you without gloves and a hat? Accessories are sometimes necessities. Find out here what accessories you need to best serve your needs. Boiler accessories can make your system a lot more efficient and effective. Knowing which accessories are right for your boiler and your home will ensure a more efficient system, and a more comfortable home. Like air, water will want to expand when it is heated. In a closed system, this will cause system pressure to increase rapidly, unless the water is given a volume to expand into. If left uncontrolled, this increase in pressure can lead to property damage, injury, or even death. An expansion tank is the most common way to control and prevent this pressure rise during normal operating conditions. The most common expansion tank design consists of a closed tank with a diaphragm or bladder splitting the tank into two sections. One side of the tank is filled with air and pressurized to match desired system conditions. The tanks come pre-charged from the factory, but often include a valve allowing the pressure to be adjusted for different applications. The other side of the tank is where water from the system will enter as it expands. The diaphragm acts as a barrier to keep the air and water from mixing. As the water increases in volume it displaces and compresses the air within the tank. Because air is much more easily compressed than water, this allows the system pressure to increase in a controlled, predictable, and safe fashion. 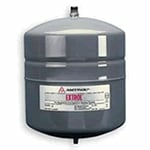 Expansion tanks are sized based on the amount of water contained within the system, the change in temperature of the water, and the maximum acceptable pressure within the system. The appropriate expansion tank can also be estimated based on the type of heat emitters used and the output of the heat source. For radiant systems, required expansion tank volume can be estimated from the diameter and total length of tubing installed. If your system has a larger water volume than is typical due to a storage tank, buffer tank, or exceptionally long piping runs, the sizes in the chart below may not be large enough to adequately protect your system. Tubing Length 3/8" 1/2" 5/8" 3/4" 1"
A hydronic system must be filled with water at a specific pressure in order to operate as designed. 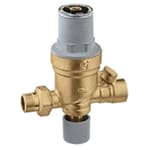 A fill valve will allow water to enter the system until it reaches the desired pressure. It is also often paired with a backflow preventer to make sure that water from the heating system does not back up into and contaminate domestic water supplies. Before it can be operated a hydronic system must be filled with water. Water must also be added if the system is drained for service, or if water escapes through leaks in the system. A fill-valve will fill the system to the desired pressure, and automatically allow more water to enter the system if the pressure drops. This ensures that the system is always filled with water to the correct pressure and operates as designed. 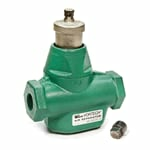 In addition to the fill-valve, systems should also be fitted with a backflow preventer. Hydronic systems often utilize materials that can be harmful if ingested. Therefore, it is important to keep the water in the hydronic system separate from domestic water supplies. By preventing the two from mixing, a backflow preventer ensures a clean drinking water supply. It is also important to monitor the system for leaks, as these can introduce oxygen into the system and cause corrosion. A water meter on the fill-line can be used to monitor how much water is being added to the system and spot leaks before they cause major problems. One of the top causes of poor performance and failure in heating systems is trapped air. Air can create traps in the high points of the system and restrict water flow, or accumulate in radiators to reduce heat output. An air separator can trap entrained and dissolved air and eliminate it through a built-in air vent. Air is always present in a hydronic system at installation and must be bled prior to using the system. Although there are a variety of bleeding methods to remove as much air as possible, even the most thorough job will leave air trapped in the system. This trapped air will slowly dissolve into the water, or be pulled along by the flowing water. Once this air is dissolved or entrained in the flowing water, it will circulate back to the boiler and ideally to an air separator. Air separators are most effective when installed on the supply side of the boiler upstream of the circulating pump. Here the water is at high temperature and low pressure, creating ideal conditions to allow dissolved water to escape. A high-quality air separator will have a large body to slow the water flow allowing air to escape. It will also have a mechanism to separate micro air bubbles and trap them in the separator. Once a sufficient volume of air has accumulated in the separator, an air vent mounted on top of the separator allows the air to escape. An air separator can typically be selected to match the size of the piping on which it will be installed. Having a hydronic system free of air will help to improve its performance, reliability, and longevity. As dangerous to a hydronic system as air, dirt and other particles can clog heat exchangers, lock pumps, and cause valves to fail. A dirt separator can trap this dirt before it has a chance to damage the system. Modern high-efficiency boilers use precision built heat exchangers with narrow passageways to maximize heat transfer. These passageways are prone to clogging, which causes the boiler to perform less efficiently and could cause the heat exchanger to fail entirely. Manufacturers typically exclude damage caused by this type of blockage from warranty coverage, as it easily preventable. A dirt separator installed on the boiler return can trap particles headed toward the boiler before they can cause any damage. 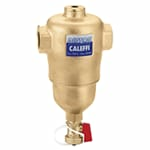 In addition to protecting boilers, dirt separators will help prevent pumps from wearing and clogging and help keep valves operating freely and sealing completely. A dirt separator typically traps dirt and particles using a fine mesh or screen, a large body slows the flow of water to allow the trapped particles to settle to the bottom. Once at the bottom, the built-in purge valve can be used to flush the particles from the system. A dirt separator is a small investment to help protect against damage that can cost thousands of dollars to repair. What Goes With My Boiler? 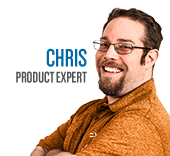 - Hydronic System Accessory Guide. Our heating, ventilation and cooling equipment how-to library can help you pick the perfect comfort solution for your home.